Hello, forex friends! The minutes of the Fed’s February huddle got released yesterday. And if you somehow missed it, then here are the key highlights from the meeting minutes that you need to know about, as well as the Greenback’s reaction. I noted in my 3 Takeaways from the February FOMC Statement that the Fed didn’t provide any forward guidance, which was a real disappointment. In simpler terms, Fed officials are uncertain on the potential effect of more fiscal stimulus under Trump, with Fed officials split between those who think that it would be good and those that think that it would be bad. But for the February FOMC meeting, most see Trump’s planned fiscal stimulus as a good thing (for now). Fed officials didn’t explain why, but that likely has something to do with exports, since a stronger Greenback would make U.S. exports relatively more expensive and less competitive. This is especially important because Trump intends to bring manufacturing jobs back into the U.S. And a stronger Greenback would make it tougher for U.S. manufacturers to compete when it come to exports. Also, weaker economic growth = no need to hike rates to stop the economy from overheating. Aside from posing a downside risk to economic activity, “several” Fed officials were also concerned that a further appreciation in the dollar would result in “downside risks to the inflation outlook.” The reasoning for this is rather simple. A stronger Greenback would make imports of non-energy commodities relatively cheaper. Cheaper imports would then mean less inflationary pressure from the tradables inflation component. And weaker inflation = less urgency to control inflation by hiking rates at a faster pace. 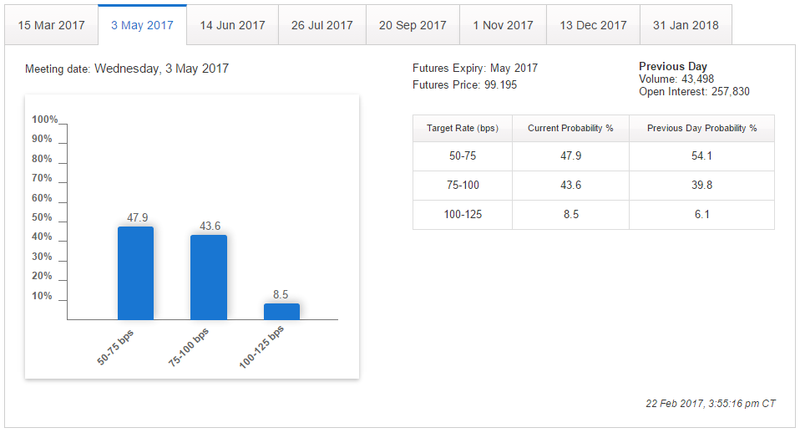 The meeting minutes, particularly the part about a rate hike “fairly soon,” actually improved rate hike odds, according to the CME Group’s Fedwatch Tool. 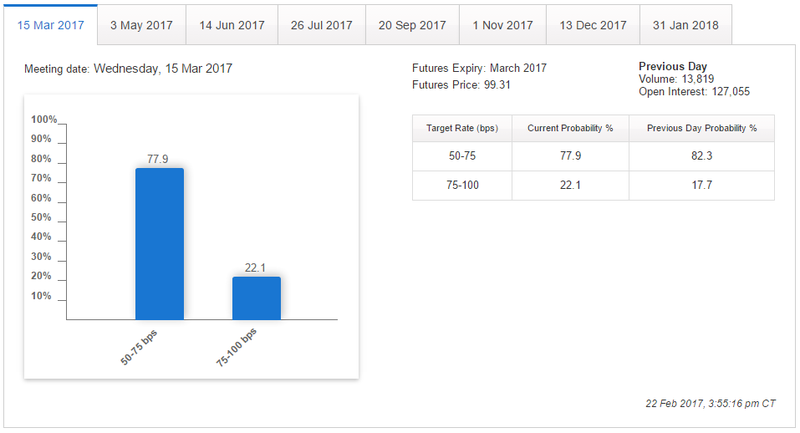 Odds for a March rate hike, for example, climbed from 17.7% to 22.1%. By the way, for the newbies out there who have no idea how to read the CME Group’s FedWatch Tool, or have no idea what’s it all about, you can check out my quick primer about it here. Meanwhile, odds for a May rate hike improved from 45.9% to 52.1%. Despite the higher rate hike expectations, the Greenback tumbled when the meeting minutes got released. The Greenback’s bearish reaction was very likely because of the Fed’s concerns that a further appreciation in the dollar’s exchange rate would pose “downside risks” to both inflation and economic activity. Another likely reason for the bearish reaction is the Fed’s cautious tone with regard to fiscal policy, since that hints that most Fed officials may be unwilling to hike further until and unless The Donald finally fleshes out his fiscal stimulus plans. Although some market analysts also say that the Fed’s message in the FOMC meeting minutes was just not hawkish enough for some market players. But then again, rate hike odds did improve, so I’m not too sure about that. So, having read all that, when do you expect the Fed to hike again? Share your thoughts by voting in the poll below!